Alex: Okay, what's bothering you? And it's not Guardian. Kara: Who says anything's bothering me? Kara: [Gasps] Crinkle. I'm going to get Botox for that. If you can figure out a way to get a needle in my skin, I mean. 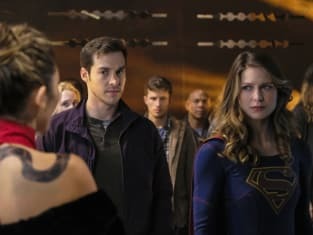 Supergirl Season 2 Episode 9: "Supergirl Lives"
Kara: What are you doing here? Mon-El: Oh, I took the day off. Kara: It's your second day. Mon-El: Yeah, didn't want to over due it. So, lunch? Permalink: Yeah, didn't want to over due it. So, lunch?